Homepage. This page: A Taxi company operating in the Ennerdale area during the pre-war years. Aldby Garage, Ennerdale Road (Taxi Hire). 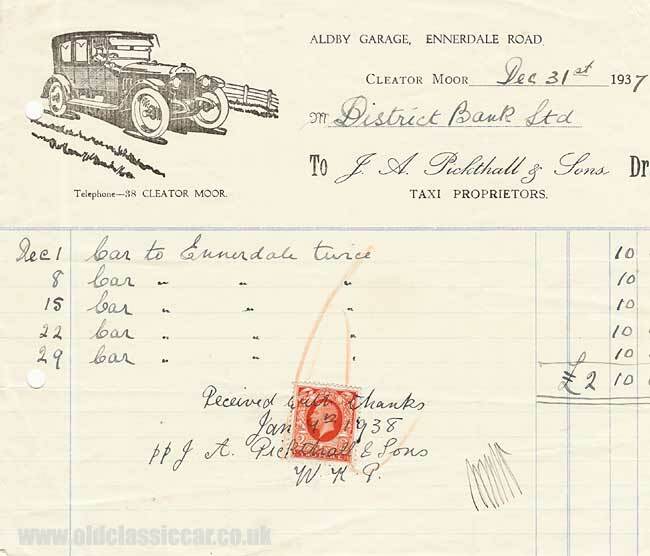 Here is another old 1930s invoice with nice artwork featuring in the billhead, this time for a taxi operator that was based in Cumbria (UK). J.A Pickthall & Sons were located on the Ennerdale Road area, at Aldby Garage in Cleaton Moor. Can anyone tell me if by any chance a garage still exists at this location? This invoice, dating to December 1937, refers to a number of journeys done for a local bank earlier in the same month. At the top left is a handsome illustration of a 1920s/1930s motor-car, with a diminutive chauffeur at the wheel of his steed ... quite what car is shown is anyone's guess - I'd vote for it being an Austin. Whether the operator had one or more taxis, is unclear. Collecting classic taxis has a loyal, but small, band of followers with examples from Austin, and specialist taxi manufacturers such as Carbodies, surviving into preservation. Some enterprising owners even use their vintage taxis for wedding hire - anything to be a bit different than the usual brush painted Silver Shadow sounds like a good idea to me! There don't seem to be many classic taxi-related sites around, but I did stumble across this interesting website, which refers to the old black & white Carry On Cabby film, starring Sid James and the rest of the Carry On regulars, back in 1963 .. the site author has tracked down many of the locations used in filming, and compared the early sixties' views with those of today - well worth a look as it is interesting how many areas get re-developed over time, whereas others change very little. "I have just found the copy of the taxi invoice from 1937 on your site. J A Pickthall was my great grandfather who started a haulage business in 1922 which ran untill the 90's. I'm not sure how long they ran taxis but the main business was furniture removals and livestock haulage running apx 30 wagons at its peak. The "W.K.P." initials on the invoice was my grandfather and I have attached a photo of him in one of the taxis (not sure of the make - maybe you could help). The garage at Cleator Moor is still currently used by a local coach operator but I'm led to believe it will shortly be redeveloped for housing." Thanks for contacting me Barry, amazing to hear from a relative of J A Pickthall. The photo Barry sent shows a vintage Crossley motor-car, with his grandfather behind the wheel. 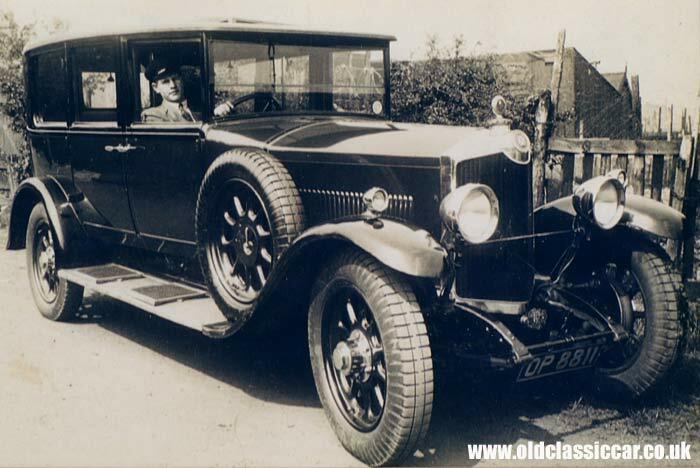 In April 2009, another photo showing a vintage Crossley motor-car was added to the site - visit this page in the vintage photographs section, to see it.